While large German cities like Berlin and Munich take most of the limelight, a very old city tucked away in the country’s southern region carries on, without much press, quite contently. Augsburg remains a colorful tapestry that took thousands of years to build. Beginning as a military war camp in 15 BC to now a puppet-loving, Berliner Weisse-drinking, bike-riding town, the Bavarian city continues to thrive and is even more magical on foot. Welcome to Augsburg. Thanks to the Romans, Augsburg made its first mark on the world over 2,000 years ago. Historical titans like Augustus and Jakob Fugger still haunt the streets today in their tall, bronze glory. As the third largest city in Bavaria and one of Germany’s oldest towns, Augsburg has been coated with several layers of architectural paint, including Renaissance, Baroque and 19th century-style landmarks. Less than two hours away is the enchanting Neuschwanstein Castle nestled in Alpine foothills. The Augsburg Puppenkiste (Puppet Theater) is not only renowned within city limits, but all over the world. Like most of Germany, there’s a story in every nook and cranny. 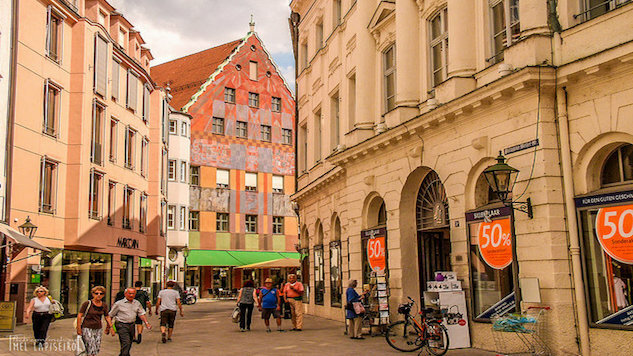 While it may not be quite the running capital like Berlin, Augsburg’s colorful, art-saturated streets deserve to be seen. The best way to relive the past? Get up close and personal. The best way to do that? Your feet. Augsburg’s climate is ideal for running—even the hottest day in August tends to not break 80 degrees. With rainfall ranging from one to four inches, worrying about a downpour during training is hardly an issue. For a quick jaunt through the heart of the city, try this 2.88 mile loop that starts right outside of Rathaus Augsburg (Town Hall) on the corner of Oberer Graben and Vogelmauer. You’ll cross the Lech River and enjoy the pastel-colored boxed housing en route. Just southeast of downtown is the Siebentischwald forest great place to run with 3K, 5K and 8K loops. The name translates to “forest of the seven tables” and the land stretches down through most of the city along the Lech river. Some cycling, hiking and running trails lead to lakes, such as the Kuhsee. The forest remains one of the last preserved landscapes of the river and is the main running hub of the city. A club that will not only up your running game but also finesse your triathlon skills is TG Viktoria Augsburg. There’s never a dull moment with competitions, races, and triathlons constantly occurring. This club is definitely on the more rigid, competitive side, so if you were born to race and born to win—this crew is for you. For those of you with children, your kids can participate in TSG Augsburg, a program dedicated to train youths in coordination and speed, running being one of the methods. Their training days are on Monday and Friday nights. Good news for runners hoping to explore the city: unlike some other major European cities, Augsburg is very bike and pedestrian-friendly. Even if weaving through the narrow streets seem overwhelming, there’s no doubt a community of runners are waiting for you in nearby woods. One thing is for sure: Augsburg is calling and you won’t regret running to answer. Can’t miss: In Augsburg: Fuggerei, Jakob Fugger’s 16th century social housing community. Just an hour and a half away: That dreamy Neuschwanstein castle you’ve seen so many pictures of.